Theresa May will travel to Dublin later to discuss the Brexit negotiations' main sticking point with her Irish counterpart Leo Varadkar. The PM is seeking legally binding changes to the backstop - the plan to avoid the return of Irish border checks should no UK-EU trade deal be in place. Both Mr Varadkar and the EU have repeatedly rejected calls for changes. Shadow Chancellor John McDonnell told the BBC he believed there was now a Commons majority for Labour's plan. The party is seeking a permanent UK-wide customs union with the European Union after Brexit, which would allow the UK "a say" in future trade deals. "The prime minister has to accept that the only way she will get something through Parliament is a compromise like this," he said. "We believe that this is a deal that could fly within Parliament." Meanwhile, a former civil service chief has called for delays to the withdrawal process to avoid a "blindfold Brexit". In a report published by the People's Vote campaign for a further EU referendum, Lord Kerslake said the UK was not ready to leave. "Britain is divided, directionless and hurtling towards a legal deadline, with no idea where we will end up after we cross it," said the peer, who is now a Labour adviser. The UK is due to leave the EU on 29 March. However, Mrs May is still attempting to negotiate changes to the withdrawal agreement she struck with the EU last year but which has since been rejected by MPs. 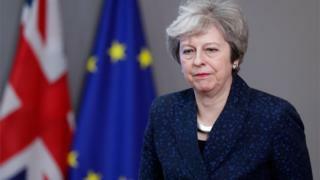 After meeting EU leaders in Brussels on Thursday, she said she had "set out very clearly the position from Parliament that we must have legally binding changes to the withdrawal agreement" to deal with MPs' concerns about the backstop. The backstop is an "insurance policy" designed to avoid the return of customs checkpoints at the Irish border after Brexit, which many fear could threaten the peace process. But many MPs object to the arrangement, which they say could leave the UK "trapped" under EU rules indefinitely. 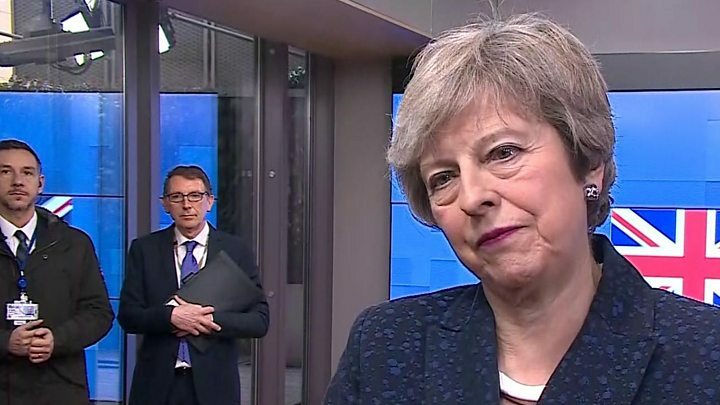 Media captionTheresa May: "I am clear that I am going to deliver Brexit, deliver it on time." Mr Varadkar will travel to Belfast for talks with Northern Ireland's five main political parties before returning to Dublin to meet Mrs May over dinner. BBC Ireland correspondent Chris Page said: "Ireland has consistently said it won't negotiate directly with Britain because this can be done only by the EU, so it's describing the meeting today as discussions, not negotiations." Ahead of the meeting, Attorney General Geoffrey Cox will hold talks in the Irish capital with his Irish counterpart, Seamus Woulfe. Mr Cox has been leading work within Whitehall on providing either a time limit on the backstop or giving the UK an exit mechanism from it. Dublin has insisted the backstop cannot be time-limited if it is to prove effective. Meanwhile, Downing Street has said ministers are looking "with interest" at a letter from Labour leader Jeremy Corbyn setting out the terms on which he would offer his party's backing for Mrs May's deal. A senior No 10 source said the government was "looking at those proposals but there are obviously very considerable points of difference that exist between us. "The PM continues to believe an independent trade policy is one of the key advantages of Brexit." The Labour leader's five demands include a "permanent and comprehensive UK-wide customs union" aligned with the EU's customs rules but with an agreement "that includes a UK say on future EU trade deals". Cabinet Office Minister David Lidington has described the latter point as "wishful thinking" but said he would meet Labour's Brexit spokesman Sir Keir Starmer. What's behind Corbyn's Brexit letter to May? And while Mr Corbyn's Brexit stance has angered Labour members of the People's Vote campaign, other backbenchers said it opened the possibility of a closer relationship with the EU than Mrs May was currently proposing. Wrexham MP Ian Lucas told BBC Newsnight this would be favoured by British manufacturers. "There's a natural majority in the House of Commons for a 'soft' Brexit but the prime minister to date has refused to put that natural majority together. What Jeremy has done today is write a letter which could make that happen," he said.